The "Skyfall" crew have been busy at the famous Ascot Racecourse in Berkshire this week, but the location will not be featuring as you may expect. Back in 1985, the racetrack appeared in "A View To A Kill". But this time, the new modern grandstand structure will instead be doubling for Shanghai International Airport. Filming has been taking place at after dark for scenes set at night, presumably to help hide the racetrack outside. 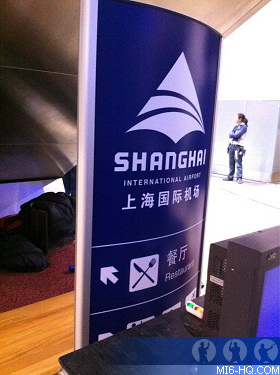 New signs were erected with Shanghai International Airport logos, with blue banners matching the real airport exactly, as well as complimenting the grandstand's existing colour scheme. After a minor power outage in the morning, the shoot on Thursday ran over from a 7:30pm wrap to 3am. On Friday, scenes at Royal Ascot involved 300 Chinese extras. "Skyfall" will shoot in Shanghai, China, but it is not uncommon for Bond productions to use local spots to double foreign locations. Back in 1995, Epsom Downs Racecourse doubled for St Petersburg Airport in "GoldenEye" to reduce expenses and security concerns, as the second unit sent to Russia required bodyguards. Left: A photo posted on Twitter of a prop sign used during the "Skyfall" filming. The National Art Gallery may be appearing as itself in "Skyfall" as extras have been cast as 'Art Gallery Goers'. Daniel Craig was snapped outside the location last week. According to tipsters, a massive outdoor set is being constructed for "Skyfall" at Pinewood Studios. The production has been buying up lots of old VW Beetle cars which are not expected to be in running condition after filming is completed. Shooting will take place in the next few weeks at the The Four Seasons Hotel in Canary Wharf, London. Virgin Atlantic will once again be transporting 007. The airline has been associated with the series since 2006's "Casino Royale".